That’s a bit of a mouthful for a blog, if not nice and alliterative. But what we’re about to share with you is worth the mouth-full of a title! 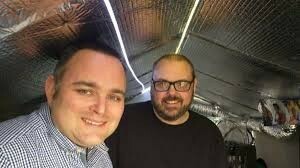 You may have seen media reports of these two 3D printing heroes (right): Stephen Davies and Drew Murray – AKA Team Unlimbited. A neat play on words there as you’ll discover. In a shed, they’re busy 3D printing replacement limbs for children who are amputees. All done for free in their spare time, because it makes a difference to those children. When we’re out and about talking 3D printing, we get to hear all sorts of stories. Often like that of the shed guys. Take the chap printing missing parts for Barbie dolls. They get sent out to war torn areas and refugee camps. Because he understands that a child still needs to be a child and a complete toy can help. There are lots of outstanding people, making a difference with 3D printing. It warms the cockles of your heart and restores your faith in human nature. 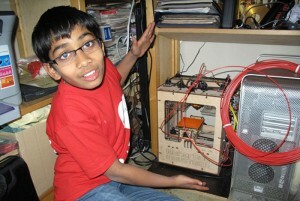 One very young man, Belgian Ritik Mehta, has been creating 3D printed items since he was 10 years old. And at the grand old age of 13, gave his first Tedxkids talk. What’s so special about Ritik? He has put his 3D printing expertise to philanthropic purpose from the outset. In 2014, Ritik created a Music for Life event – based on a similar event, held by Studio Brussel. There he helped attendees create and print their own 3D printed glasses. The event’s proceeds went to a charity that provides children in Africa and Asia with eyeglasses. It’s not only the standalone individual though that are printing good deeds; Communities of like-minded people have developed everywhere. For example, e-Nable, ‘a global network of passionate volunteers using 3D printing to give the world a helping hand.’ And that sums them up well. They’re a group of volunteers who 3D print, arms and hands for those in need. In 2011, Ivan Owen created a funky, functioning metal puppet for a steampunk event. On his return, he uploaded a short video of it in creation. In time-honoured, world wide web tradition, a carpenter in South Africa, missing a finger from an accident, saw the video uploaded by Ivan Owen. And thus began a year-long collaboration to create a new finger. But it didn’t end there. The mum of a 5-year-old boy contacted them. Could Ivan make a small hand, as her lad had been born without fingers on his right hand. Ivan worked from a prosthetic hand design from the 1800s, but realised that the 5-year-old boy would soon outgrow the hand. How could he keep up with new hands? Enter 3D printing. With 3D printing technology, Ivan honed his design. When he was happy with it he launched the files for the 3D hand on to Thingiverse in 2013. And there you have it. Ivan could have run for the hills with his hand, got it patented, and made a wad of money. But he didn’t do that. Instead, he gave the files to Thingiverse, and thereby the planet. Makers and tinkerers found the files. They left comments and started to print their own arms etc. Within two years the community had grown to 7000 members, with over 2000 devices created and gifted in forty-five countries. As a 3D printing company we’re conscious of our waste products. We work with recyclable waste and recycle it on so it’s used again. In India, Sidhant Pai has been investigating waste plastic. There are over 15 million people worldwide subsisting on what they can earn waste picking. Their earnings are less than a dollar a day. The majority of those people are picking waste plastic. Humans produce over 300m tonnes of plastic globally every year. And approximately one rubbish truck worth goes into the ocean every minute. So we need ways to reduce this pollution. And we need it fast! In 2012, together with his parents, he created Protoprint, a social enterprise. They started out experimenting with other products. Then they decided to turn the landfill waste plastic (particularly high-density polyethylene ((HPDE)) used in the main for plastic bottles), into filament; the inks used by 3D printers. Protoprint, partnered with SwaCH – a co-operative owned by waste pickers. Together they’ve set up a low-cost filament production factory at the local rubbish dump. Now Protoprint buy the filament from SwaCH at £3.50 per kg, compared with a waste picker selling a kg of plastic to scrap merchants for 23p. Even after all costs etc., there is still a 6-8 times multiplier in the price paid per kilo. Market analysts predict that 3D printing could be worth at least 1.07bn by 2021 – according to their report. That’s a lot of plastic! 3D printing has become more visible in the last three-five years, because the technology to print in the home/small business has caught up. The design packages and the extra tech required have become cheaper, so that will continue. This is fantastic news, for both the entrepreneur and the philanthropist. If we look outside our own bubbles, or front door, we can use 3D printing for the greater good. Do check out Ritik’s Ted Talks, and claim you spotted him first! Look at e-Nable’s hands and the difference they’re making. If for no other reason than to feel all warm and fuzzy about the human race! We’re always trying to find new innovation and fun items to share, so check out our Facebook and Instagram posts.